To reach Lake Abert, in the high desert of southern Oregon, you can drive south from Bend for about two and a half hours, across the remote northern end of the Great Basin, where there is nothing but you and the sky and the occasional prairie dog dashing across the road. Or you can head north from Reno for four hours, across an equally remote slice of far northeastern California, where, in the rolling sagebrush of the Lassen National Forest, you might feel as if you’ve reached the center of nowhere. Which is to say, Lake Abert is seriously off the beaten path. Unless you’re a migrating shorebird or waterbird: an eared grebe, perhaps, or a Wilson’s phalarope. In that case, chances are high that your ancestors have visited Lake Abert every fall — and perhaps every spring — for thousands of years. There, generation after generation, they’ve fattened up for the long journey to South America, happily chowing down on the brine shrimp and brine flies that usually thrive in this vast salt lake. This August or September, though, when your flock touches down at Lake Abert, you might find that the 36,500-acre basin has turned to dust. Foster has a white handlebar mustache and the tanned, grizzled countenance of a life lived outdoors in the sun. He has spent much of it here in Lake County, nearly 8,400 square miles of ranchland where the population is roughly one person per square mile. Most towns are little more than a general store, and you can drive for nearly 100 miles without finding gas. During the first week of September, Foster says, it usually takes him two and a half hours to drive up U.S. 395, on Abert’s eastern rim, stopping at every pullout to count shorebirds. Last year, it took 20 minutes. “You stop, set up your spotting scope, and go, yeah, there’s six gulls and three ravens,” Foster told me, as we stood at Abert’s edge in late April, watching a few dozen grebes float in the cool water. With warmer temperatures and persistent drought likely to become the regional status quo, these lakes face an increasingly precarious future. Unfortunately for the birds, they use the lake primarily in late summer, which is exactly when it may become largely dry. Lake Abert ranks among the most important sites in the Western Hemisphere for shorebirds. Surely, you might think, there must be a plan in place — or at least in the works — to ensure adequate water levels. But you’d be wrong. Despite its recognized international importance — it may be crucial to some bird populations’ survival — Lake Abert has no legal right to water. And, at present, the only agency that has jurisdiction over its water — the Oregon Water Resources Department — has no plans to change anything. Back in the late Pleistocene, maybe 25,000 years ago, a massive glacial lake called Pluvial Lake Chewaucan covered 480 square miles of what’s now southern Oregon. In those wetter, colder times, the giant lake, formed by rocky blocks of earth dropping down along a fault line, was 350 feet deep in spots. About 4,000 years ago, as the climate warmed and dried, river flows slowed and the large lake shrank into a few smaller, disconnected, shallow ones. Drive through the region’s valleys today, and you can see the ancient shorelines embossed on hillsides. Today, even when completely full, Lake Abert averages just seven feet deep. Abert and its companion lakes are closed-basin systems— terminal lakes, the end points of rivers, with no outlet except to the air. Lake County averages 49 inches of evaporation a year, Foster says, but just 10 inches of precipitation. By the late 1800s, when European settlers arrived, the Great Basin was the desert we know today. To raise cattle and grow crops, settlers needed water. “So people start diverting water out of the rivers, streams, even the springs that feed these dying lakes,” says Michael Crotteau, a forest hydrologist and the climate change coordinator for the U.S. Forest Service’s office in Lakeview, the seat of Lake County, about 25 miles south of Abert. Crotteau arrived in his current post in the summer of 2014, two years into the drought. “Goose Lake was completely dry,” he recalls. “Summer Lake was completely dry. Abert had just a puddle in it.” He marvels at the fact that, into the early 1900s, there was regular north-south ferry service across Goose Lake’s 26 miles. In April, I’d been driving north alongside the lakebed for nearly 15 minutes before I realized it was in fact Goose Lake, and that there was water shimmering somewhere way out in its middle. That means Abert might contain water in the spring but be largely dry by mid-summer — exactly when hungry birds begin arriving from Alaska and Canada, looking for easy, high-protein food to fuel their journeys. Brine flies, meanwhile, grow by the millions on the shoreline, laying their eggs on moistened rocks at the water’s edge and serving as an essential protein source for other birds. But tinker with the water’s chemistry — make it too salty or too fresh, or too basic or too acidic — and neither shrimp nor flies will breed. Exactly what is responsible for the lakes’ demise is a matter of contention, and arguing about it turned ugly the first summer Abert dried up. A 2014 investigative report by the Oregonian and a TV segment on Oregon Public Broadcasting both came down hard on state agencies for effectively sitting by and watching a crucial shorebird migration stop disappear. Since then, the mere mention of Lake Abert by a reporter sets everyone on edge. I had to plead with some state and federal agencies just to get someone to talk to me. At issue is the question of whether what you might call “natural” factors are to blame, or whether the problem is too many people taking too much water out of the river. Kyle Gorman, the South Central Region manager for the Oregon Water Resources Department, is also in the “nature” camp. He points out that since the early 1900s, there’s been little change in “consumptive use” of Chewaucan River water. The number of acres legally allowed to be irrigated with surface water rights has barely grown: Today, it’s about 40,000; in 1900, it was around 37,000. No one denies this spring is looking much better than the last two. Ron Larson, a retired biologist who has been studying Abert, and who visited it in early May, a couple of weeks after I was there, called what he saw “good news.” The lake was less saline than normal, but Larson found small brine shrimp “present in good numbers” and patches of brine flies along the shores. His conclusion was a bit more measured than Gorman’s: “We will have to see how conditions develop to know if there is a recovery,” he wrote in an email. Still, he says he’s optimistic. Also in this camp is Johnnie Moore, geochemist, birder and professor emeritus at the University of Montana, who got interested in the plight of Lake Abert a few years ago. This winter, Moore published research concluding that the lake’s low water and high pH were directly caused by upstream water withdrawals. 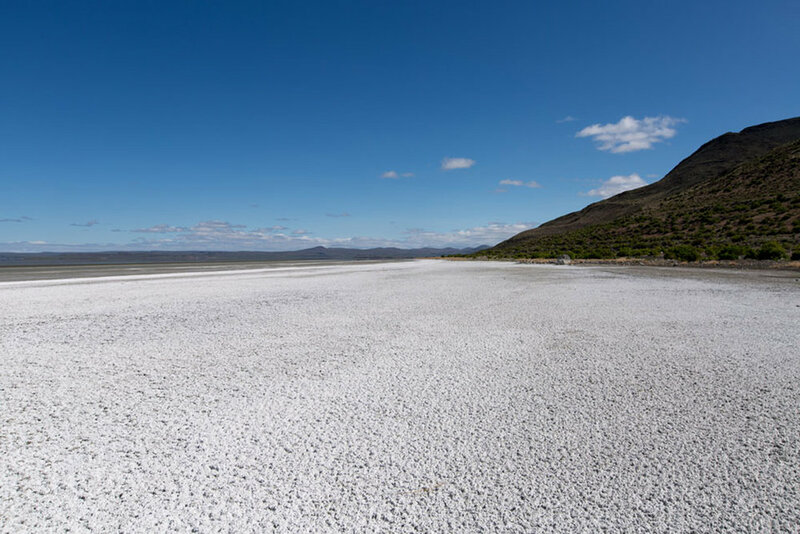 “Change in climate alone would not produce the recent low lake volumes and high salinities that have destroyed the brine shrimp and alkali fly populations and depleted shorebird use at Lake Abert,” he wrote. or all the squabbling over cause, though, it’s not clear the answer matters that much, at least in the immediate future. The river is legally over-allocated; that’s a fact. Global warming is changing the snowpack, so there will be less water flowing through the Chewaucan River into Lake Abert; this is also almost certainly a fact. Whichever factor is the smoking gun, both represent the system’s prevailing conditions. And neither one is going away anytime soon. But only one of these factors — in theory, anyway — is alterable: irrigation. One possible way to keep Abert’s water levels, salinity and alkalinity stable during dry years would be to ask ranchers to use less water at certain times. Aside from the obvious obstacles — livelihoods might be at stake, entire communities have grown up around existing water rights — there’s another complicating factor. Most local ranches grow native hay, the same types of grasses that grew here naturally, and during spring runoff, the ranchers flood their meadows, creating artificial wetlands. These wetlands teem with birds — ducks, geese, sandhill cranes, white-faced ibises. “The amount of waterfowl and waterbird use in the marshes is equally as stupendous or phenomenal as the amount of shorebird use on this lake,” says Foster. Roughly 80 percent of the pintail ducks on the Pacific Flyway, for instance, stop in these human-altered Chewaucan marshes. Filling Abert might mean sacrificing one set of birds for another. Abert’s federal landlord, the Bureau of Land Management, is focused on the lake’s ecosystem and importance to migrating birds, and it has designated Lake Abert an “area of critical environmental concern.” What that does, explains Todd Forbes, the BLM’s field manager for its Lakeview Resource Area, “is make it easier for us to say, ‘This area of Abert Lake is really important to migratory birds, so everything else is going to take a backseat.’ ” That has meant saying no to a proposed sodium mining operation and a pumped-storage hydroelectric project. (The latter seems particularly absurd, given current lake levels.) It has also meant keeping the lake off-limits to everything from new roads to motorized recreation to windsurfing. But while the BLM’s designation is admirable, it’s also a bit misleading. Because, in fact, the BLM has absolutely zero jurisdiction over Lake Abert’s most important aspect: its water. In the summer of 2010, high salinity, hot temperatures and little wind combined to kill brine shrimp, forming red streaks at the surface of Lake Albert. The department also has a new grant program for something called “place-based funding.” This, Gorman suggests, might be a way to start exploring potential solutions. Like the BLM designation, though, it’s commendable but seems pretty flaccid considering what’s at stake. “You’d want to develop a hydrologic model from the lake and say, ‘If we lease some water in-stream’ ” — pay ranchers to leave water in Chewaucan River — “ ‘will that have an effect on the lake?’ When you talk about in-stream leasing and transfers, it’s always through a mutual or a voluntary basis, not a top-down approach from the department.” In other words, a broad-based group of local stakeholders would need to apply, through a competitive process, for money to fund research into possible ways to keep water in the lake. It doesn’t exactly sound user-friendly. So far, no one from the region has applied. While she waits for funding, though, Haig is studying bugs. She’s intrigued by another crucial question: Could bird food move across the landscape? Which wetlands are most important, and what might happen if they disappear? Rising along the western edge of Lake Abert and stretching for more than 30 miles is Abert Rim, a 2,500-foot fault scarp — a cliff caused by earth shifting along a fault — that gives the lake a dramatic backdrop but also hems it in, making it feel even more isolated. Parking his pickup at a pullout beneath the rim, Foster and I scrambled down the slope from the highway to the shore for a better look at the water level, the grebes, and the salt-crusted shoreline, which was lined with volcanic rocks and mats of discarded brine-fly exoskeletons. The wind drowned out what traffic there was on the road above us, and the desert sun did its best to heat a chilly afternoon. Standing there it felt like the whole world had vanished away. But Lake Abert is the opposite, isolated in an isolated corner of the world. And it holds no real economic value, since the birds that use it aren’t the kind people hunt. “Coming to Lake Abert and looking at shorebirds is not a million-dollar industry,” jokes Foster. What will it take to save Lake Abert, and the rest of Oregon’s terminal lakes? The current drought has left Mono Lake just 13 inches above an “ecologically precipitous” level, despite nearly 40 years of conservation efforts and a successful legal battle waged by a 20,000-member organization. And that Mono Lake-scale of dedication and support seems unlikely here, at least in the near term. Though the hour is late for Oregon’s terminal lakes, the will to act on their behalf is only just stirring. The National Audubon Society recently finished a new strategic plan that identifies Western water as a core theme for the next five years. But what exactly that means, and where the money will come from, and go to, is an open question. The Intermountain West Joint Venture, a partnership-based migratory bird conservation program connected to the U.S. Fish and Wildlife Service, is midway through a project using 30 years of satellite images to track how water moves across the landscape and through time — to “capture a picture of how the landscape breathes,” as Josh Vest, the program’s science coordinator, puts it. In the near future, Vest hopes the work will translate into “some strategic investments in conservation” in southern Oregon. Although about 80 percent of the Intermountain West is public lands, about 70 percent of its emergent wetlands — marshes, wet meadows, prairie potholes — are on private land. “We’re trying to provide conservation strategies that can fit within these working landscapes,” Vest says. In that respect, any mechanism for saving Abert will have to follow a path already blazed by a century of migratory bird conservation. “To create viable refuges, the FWS had to carve out new spaces within this irrigated, industrialized agricultural landscape,” wrote Syracuse University geographer Robert Wilson in his book Seeking Refuge: Birds and Landscapes of the Pacific Flyway. Drive along the Chewaucan marshes west of Lake Abert in the spring, and if you don’t know what you’re looking at, you could easily mistake it for a natural wetland system. Sandhill cranes wade elegantly through flooded meadows under the desert sun, in postcard-perfect marsh scenery. But the wetlands fill and drain with the help of human hands. “People have settled and roads have gone through and all kinds of things have happened,” says rancher John O’Keefe. “So the manipulation we get from the diversion and spreading of the water and draining of the water is probably the closest thing to the natural flooding and receding that we could have in the current environment.” We were drinking coffee beneath the taxidermy — deer, bison, pronghorns — at the Adel Store, a shop, café, bar and general community hub in this Irish Catholic community of about 60 people. “To the extent that we interfere with that process, we’ll probably be moving away from the natural processes rather than back to ’em.” As we stood to leave, I offered to pay for our coffee, and O’Keefe laughed. “They don’t take money here,” he said. Whether we can find a way to protect the lake — and other similarly threatened saline lakes in the Great Basin and around the world — may ultimately determine what sort of birds will fly overhead in the future.